Playing like rock stars, Boulder City High School’s baseball team routed its opponents 34-0 in this week’s three-game slate, advancing to 13-2 on the season. (Robert Vendettoli/Boulder City Review) Helping break the game open, Boulder City High School sophomore Matthew Felsenfeld helped spark a six-run first inning against Democracy Prep on Monday, March 25, 2019, with an RBI single. The Eagles defeated Valley 11-0 on March 20, SLAM Academy 8-0 on Friday, March 22, and Democracy Prep 15-0 on Monday, March 25. Lighting up the scoreboard, sophomore Matthew Felsenfeld led all players with three runs batted in after a 2 for 3 performance against Democracy Prep, while sophomore Blaze Trumble finished 1 for 2 with a two-run home run. Knocking in two runs each against Valley were senior Jimmy Dunagan (2 for 3, with two doubles), sophomore Troy Connell (2 for 2) and Giunta (1 for 3). Giunta batted 1 for 1 against SLAM Academy. 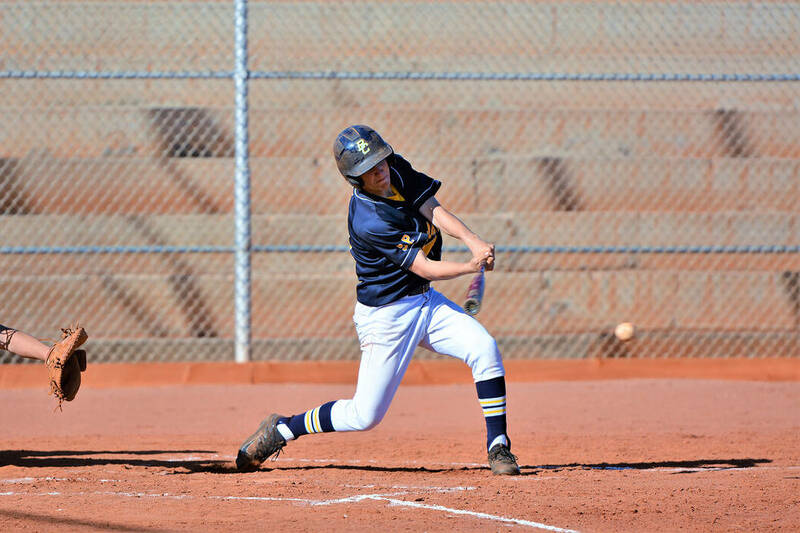 Finding their groove with the Eagles after transferring from 4A Basic, senior Brendan Thorpe drove in two runs against both Valley and SLAM Academy, and senior Brian Miller threw two scoreless innings against SLAM Academy with two strikeouts. The strength of the Eagles this season is their deep pitching, evident by five arms throwing against SLAM Academy in a combined three-hit effort. Trumble earned the victory against SLAM Academy after throwing a scoreless third inning, while Connell went the distance against Valley and sophomore J.J. Neal finished out Democracy Prep. Neal threw a three-inning no hitter against Democracy Prep with eight strikeouts. Connell allowed only one hit against Valley with six strikeouts. Fielding what looks to be the top team in the 3A classification, the Eagles will get their chance to prove how good they are when league play starts Friday, March 29, with a road game at Chaparral. Boulder City will host Sunrise Mountain on Tuesday, April 2.